I tightly cropped my photograph of a lily taken in neighborhood garden. 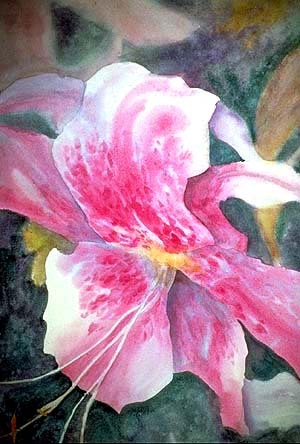 Then I painted the watercolor using the delicate pigments, Rose Madder Genuine, Aureolin and Cobalt Blue, pushing the red to its maximum intensity and playing it against neutral mixtures of the other colors in the background.The color scheme is analogous complementary, through the violet range, accented by yellow-green complements. The result is a strong design with interesting negative shapes. Color schemes are described in detail in chapter six, "Expanding Your Palette With Color Schemes" of Exploring Color.